This 6 m-wingspan unmanned aircraft is supported in mid-air within ESA's Hertz radio-frequency test chamber, as if suspended in flight, to check it can maintain contact with its controller through satellite links. The drone, developed by Barnard Microsystems Ltd of the UK, has been fitted with a steerable array antenna in its wing to keep contact with the Inmarsat constellation. This is the focus of ESA's ESTARR project – Electronically Steered Antenna Array in the Wing of a Remotely Piloted Aircraft – which is investigating the feasibility of steerable low-cost array antenna in the drone's wings. Designed for oil, gas and mineral prospecting, pipeline surveying and border patrols, the drone will spend most of its time operating far from its controller, often in areas with no communications infrastructure. To ensure the legally mandated link between the remote pilot and the drone, a satellite data relay service must be used. The array must electronically sweep its beam rapidly to counteract any movement of the drone, and maintain the all-important control link with space, without any aerodynamic or electronic interference with the functioning of the drone itself. 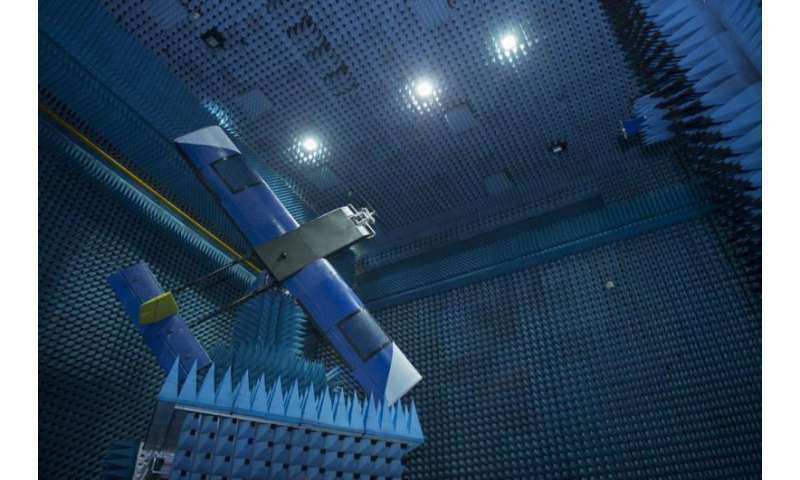 Testing was performed in ESA's metal-walled Hybrid European Radio Frequency and Antenna Test Zone at the Agency's technical centre in the Netherlands, shut off from all external influences for radio testing. Its internal walls are studded with radio-absorbing 'anechoic' foam pyramids, preventing any distorting radio signal reflections, while also absorbing noise.